Once again, you asked and we answered: The is a pair ( a pack of two) replacement/spare coils, made by HS VapourMX for HS VapourMX GT. Perfect to have in your case if your coil does burn out or stops responding. I suppose it is like having a first aid kit : you hope you will never need it, but if you do, you are happy that you have it. 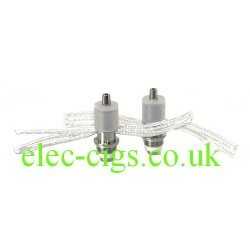 At only £2.99 for two of them, if you have a VapourMX GT e-cigarette (pre TPD), get the vapourmx replacement coils. PLEASE NOTE: THESE COILS ARE FOR A 'PRE TPD' (THE ONES WHICH WE DON'T SELL NOW) GT ATOMIZER ONLY (3 ML) AND THE COTTON MAY NEED TRIMMING IN LENGTH. Click here for coils for the NEW 2 ML GT ATOMIZER.